Do you frequently use more than one PC? If so, you should consider using either Google Drive or Microsoft SkyDrive to share files among your different computers. Both of these services operate in a similar manner. Both services are free. If you use GMail regularly, I recommend Google Drive. If you don’t use GMail, I recommend SkyDrive. With Google Drive, your account is tied to a Google Account (GMail or Google Apps.) SkyDrive is tied to a Microsoft Account (Hotmail, Passport, or Outlook.com.) Moving forward I’ll use “Drive” to interchangeably reference either service. Once you’ve installed the “Drive” software, there will be a new folder on your PC. When you save or copy a file to that local folder, a copy will be transmitted through your Internet connection to the “Drive” service. If you have more than one PC running, with the same account, the file will automatically sent to each of those PCs. 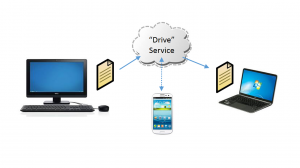 An additional benefit of using a “Drive” service is that you can access your files from a smartphone, tablet, or other Internet connected device at any time. The data you store in your “Drive” service is only visible to you. I would be reluctant to copy any sensitive or protected information to an Internet “Drive” service like this, but for most of your data, this should be a relatively safe idea. If one of these services stops working, or your Internet connection is interrupted, your data will still be stored on your local PC. WordPress generated this page with 43 queries, in 1.073 seconds.